Paul Iribe (1883-1935) was born in Angoulême, France. He started his career in illustration and design as a newspaper typographer and magazine illustrator at numerous Parisian journals and daily papers, including Le temps and Le rire. In 1906 Iribe collaborated with a number of avant-garde artists to create the satirical journal Le témoin, and his illustrations in this journal attracted the attention of the fashion designer Paul Poiret. Poiret commissioned Iribe to illustrate his first major dress collection in a 1908 portfolio entitled Les robes de Paul Poiret racontées par Paul Iribe. This limited edition publication (250 copies) was innovative in its use of vivid fauvist colors and the simplified lines and flattened planes of Japanese prints. To create the plates, Iribe utilized a hand-coloring process called pochoir, in which bronze or zinc stencils are used to build up layers of color gradually. This publication, and others that followed, anticipated a revival of the fashion plate in a modernist style to reflect a newer, more streamlined fashionable silhouette. 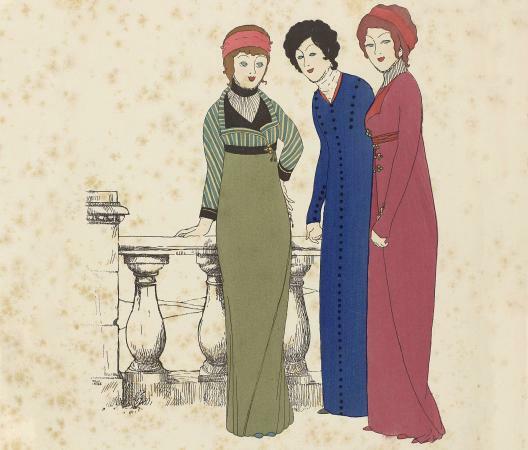 In 1911 the couturier Jeanne Paquin also hired Iribe, along with the illustrators Georges Lepape and Georges Barbier, to create a similar portfolio of her designs, entitled L'Eventail et la fourrure chez Paquin. Throughout the 1910s Iribe became further involved in fashion and added design for theater, interiors, and jewelry to his repertoire. He continued to illustrate fashion, opened a store of decorative art on the rue du Faubourg St.-Honoré in Paris, and created textiles for the firm Bianchini Ferier and for designer André Groult. His association with the theater resulted in several publications related to the renowned dancer Vaslav Nijinsky, including the album Prélude à l'aprés-midi d'un faune, which captured Nijinsky's choreography for the Claude Debussy composition in photography by Adolph de Meyer. Iribe is perhaps best recognized for his contributions to the Gazette du bon ton. Started in 1912 by the publisher Lucien Vogel, the fashion journal featured the creations of the top couture houses illustrated by the leading visual artists of the day, including Iribe, Georges Georges Barbier Lepape, A. E. Marty, and Charles Martin. Like Iribe's earlier work, the magazine was a deluxe limited-edition journal. The publication included between eight and ten pochoir plates in each issue and helped position fashion graphics as a modern medium. While the Gazette du bon ton slowed its publication during World War I, it resumed putting out monthly editions from the end of the war until 1925, and a total of sixty-nine issues were printed. In 1925, the publisher Condé Nast purchased the Gazette and it merged with Vogue. In 1919 Iribe moved to New York, and his art deco style was further disseminated to the American fashion-buying public through his continued work in fashion illustration and interior design. His work was published in seven issues of American Vogue, and he also opened a store on Fifth Avenue called Paul Iribe Designs New York-Paris. Iribe was one of the first French fashion figures to work in Hollywood. Cecil B. DeMille commissioned him to create clothing for Gloria Swanson in the 1919 film Male and Female. This film marked the beginning of a six-year collaboration with the Hollywood studio, during which Iribe acted as artistic director for eight DeMille films. Iribe moved back to France in 1930 and became involved in numerous design projects, including the publication of Choix, a book that showcased his designs for furniture, decorative arts, and jewelry. He continued to design jewelry, working with Coco Chanel in 1932 to create a line that her couture house produced. In 1933 Iribe was awarded la Légion d'honneur for his work as an artist-illustrator. He died of a heart attack in 1935 at Chanel's villa in Roquebrune Cap Martin, France. See also Art and Fashion; Art Nouveau and Art Deco; Dance and Fashion; Fashion Illustrators; Fashion Magazines. Lelieur, Anne-Claude. Paul Iribe: Précurseur de l'art déco. Paris: Bibliothèque Forney, 1983. Robinson, Julian. The Golden Age of Style: Art Deco Fashion Illustration. New York: Harcourt Brace Jovanovich, 1976.